Essentially the microscopic equivalent of a single sheet of paper, a 2D nanosheet is a material that is constrained to up to only a few atomic layers in one direction. Nanomaterials—materials that are constrained in at least one dimension to a maximum of a handful of atomic layers—have unique physical properties that alter their electronic and chemical properties in relation to their compositionally identical but conventional, and larger, material counterparts. "What's nice with a 2D nanomaterial is that because it's a sheet, it's much easier for us to manipulate compared to other types of nanomaterials," says Xudong Wang. "The course includes a lecture about self-assembly of monolayers," says Xudong Wang. 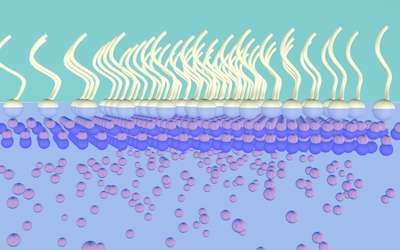 "Under the correct conditions, a surfactant will self-assemble to form a monolayer. This is a well-known process that I teach in class. So while teaching this I wondered why we wouldn't be able to reverse this method and use the surfactant monolayer first to grow the crystalline face." "We are very excited about this," says Xudong Wang. "This is definitely a new way to fabricate 2D nanosheets, and it has great potential for different materials and for many different applications." Already the researchers have has found that the 2D zinc oxide nanosheets they've grown are able to function as p-type semiconductor transistors, which is the opposite electronic behavior of naturally occurring zinc oxide. Researchers have for some time attempted to produce zinc oxide with reliable p-type semiconductor properties. But the zinc oxide nanosheets are only the first of what could be a revolution in 2D nanomaterials. Already, the UW-Madison team is applying its surfactant method to growing 2D nanosheets of gold and palladium, and the technique holds promise for growing nanosheets from all sorts of metals that wouldn't form them naturally. "It brings a lot of new functional material to this 2D material category," Xudong Wang says.